The clearest thing to emerge from the mayoral race this week is that no one can agree about buses. 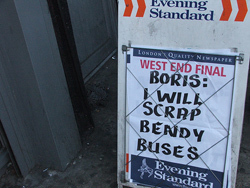 The arguments began last Wednesday when Boris Johnson told Vanessa Feltz that the '21st Century' Routemasters he wants to replace bendy buses with would all have conductors and that these would cost 'eight million quid'. Ken Livingstone went on the show next day to say Boris’s figures were fine except he’d left a nought off the end. By the time The Blond launched his transport manifesto at The Gymnasium near St Pancras on Monday morning, a full scale row was brewing, and with Johnson again sticking to his £8 million figure at a transport hustings on Tuesday it was time for Londonist to establish the facts. Deviously disguised as a Guardian reporter, we secured the calculations of both campaign teams, then asked Transport for London to cost the entire Johnson plan. It estimated that if passenger capacity on the present 12 bendy routes was to be maintained using modern double deckers instead, you’d need a lot more of them, extra drivers to drive them and 1,761 conductors. The latter would cost £49 million – more than six times Johnson’s figure – and the whole thing, including paying for new buses, would cost £112 million more than the present bendy arrangement. Livingstone’s team is still crowing – they made it £110 million. Team Boris, though, was not amused. It pointed out that as it intends to commission a completely new bus design, TfL’s estimates were meaningless and, what’s more, politically motivated. Londonist’s view is that the Tory’s new Routemaster plan is a potential voter-winner, but that he needs to make it look better thought-through if Ken isn’t going to make him look unconvincing. Image from nicasaurusrex's Flickr photostream.